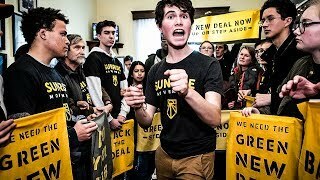 The 14-page proposal for a Green New Deal submitted to the U.S. House of Representatives by Rep. Alexandria Ocasio-Cortez, D-N.Y., does not actually mention Modern Monetary Theory (MMT), but that is the approach currently capturing the attention of the media -- and taking most of the heat. The concept is good: Abundance can be ours without worrying about taxes or debt, at least until we hit full productive capacity. But, as with most theories, the devil is in the details. In a 2013 treatise called "Modern Monetary Theory 101: A Reply to Critics," MMT academics concede this point. But they write, "These constraints do not change the end result." And here the argument gets a bit technical. Their reasoning is that "the Fed is the monopoly supplier of CB currency [central bank reserves], Treasury spends by using CB currency, and since the Treasury obtained CB currency by taxing and issuing treasuries, CB currency must be injected before taxes and bond offerings can occur." The counterargument, made by American Monetary Institute (AMI) researchers, among others, is that the central bank is not the monopoly supplier of dollars. The vast majority of the dollars circulating in the United States are created, not by the government, but by private banks when they make loans. The Fed accommodates this process by supplying central bank currency (bank reserves) as needed, and this bank-created money can be taxed or borrowed by the Treasury before a single dollar is spent by Congress. The AMI researchers contend, "All bank reserves are originally created by the Fed for banks. Government expenditure merely transfers (previous) bank reserves back to banks." As the Federal Reserve Bank of St. Louis puts it, "federal deficits do not require that the Federal Reserve purchase more government securities; therefore, federal deficits, per se, need not lead to increases in bank reserves or the money supply." To fund a project as massive as the Green New Deal, we need a mechanism that involves neither raising taxes nor adding to the federal debt; and such a mechanism is proposed in the U.S. Green New Deal itself -- a network of public banks. While little discussed in the U.S. media, that alternative is being debated in Europe, where Green New Deal proposals have been on the table since 2008. European economists have had more time to think these initiatives through, and they are less hampered by labels like "socialist" and "capitalist," which have long been integrated into their multi-party systems. The first Green New Deal proposal was published in 2008 by the New Economics Foundation on behalf of the Green New Deal Group in the U.K. The latest debate is between proponents of the Democracy in Europe Movement 2025 (DiEM25), led by former Greek finance minister Yanis Varoufakis, and French economist Thomas Piketty, author of the best-selling "Capital in the 21st Century." Piketty recommends funding a European Green New Deal by raising taxes, while Varoufakis favors a system of public green banks. Varoufakis explains that Europe needs a new source of investment money that does not involve higher taxes or government deficits. For this purpose, DiEM25 proposes "an investment-led recovery, or New Deal, program ... to be financed via public bonds issued by Europe's public investment banks (e.g., the new investment vehicle foreshadowed in countries like Britain, the European Investment Bank and the European Investment Fund in the European Union, etc.)." To ensure that these bonds do not lose their value, the central banks would stand ready to buy them above a certain yield. "In summary, DiEM25 is proposing a re-calibrated real-green investment version of Quantitative Easing that utilizes the central bank." "While Piketty is concerned to highlight differences between his proposals and those for a Green New Deal, the real difference between them is that his -- however well-intentioned -- are a wish list for a new treaty, a new institution and taxation of wealth and income. A Green New Deal needs neither treaty revisions nor new institutions and would generate both income and direct and indirect taxation from a recovery of employment. It is grounded in the precedent of the success of the bond-funded, Roosevelt New Deal which, from 1933 to 1941, reduced unemployment from over a fifth to less than a tenth, with an average annual fiscal deficit of only 3 percent."